Pets are a common fixture in many elementary classrooms all around the country. I still remember walking into my 2nd grade teacher’s room and brimming with joy that she had a fish tank. And I’m not alone in that delight. Many researchers have found that classroom pets have a positive impact on students. Pets increase students’ positive attitude towards school and can actually make them want to come to school (Anderson & Olsen). They have been found to improve the emotional well-being of students and contribute to humane education (Daly & Suggs). Contrary to popular belief, one study showed pets did not distract from the teacher (Kortschal & Ortbauer). And of all the possible choices for classroom pets, fish are the most common (Rud & Beck). This is with good reason. Fish are relatively easy to care for. They don’t need to be fed daily, so they can easily be left over the weekend or a short break. During the summer, they can be taken home or just cared for on a weekly basis. There are also a wide variety of species that can be very easily acquired. It is also possible to keep fishes that are native to your location to give students a view of wildlife they don’t normally see. 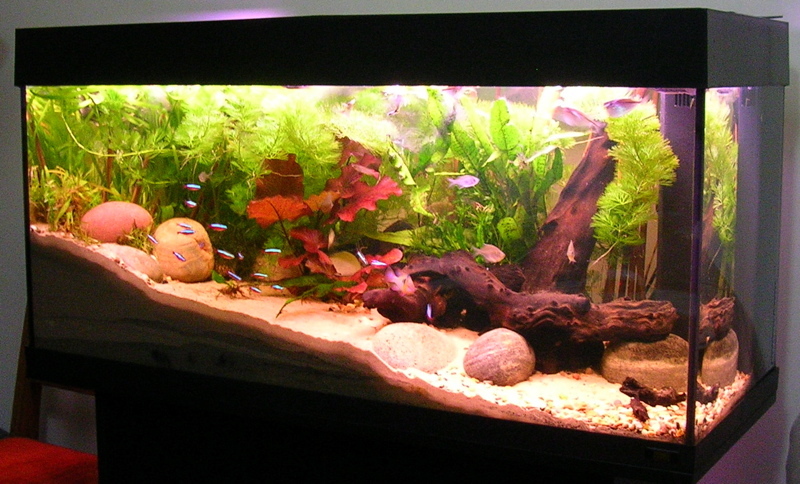 Aquariums also have a well-established relaxing effect. Watching aquariums is known to reduce heart rate and blood pressure (Cracknell et al). And if I remember school correctly, tests certainly can generate some elevated heart rates! My mother is a middle school teacher and if there is one thing teachers need, it’s reduced stress levels. So in this way, the fish tank will help the teacher as much as the students. Aquariums can be very useful teaching tools. Students can examine how a fish tank attempts to reproduce a native habitat. How the light emulates the sun; how the filter gives the fish clean water like a stream; how the pump oxygenates the water like a waterfall. If native species are available students can observe their natural habitat and try to recreate it. Fish don’t have to be the only inhabitants in an aquarium. Plants can be added to further simulate a natural environment. Plants can also be used to introduce students to the idea of nutrient cycling. Water chemistry and pollution are other lesson that can be taught with fish tank. Many pet stores carry small freshwater testing kits simple enough for middle school students. They can measure, record, and graph the temperature, pH, and nitrate levels in their fish tank. These water quality readings can be compared to local a river or pond. Teachers can actually let the fish tank get dirty to show students what happens to fish in polluted environments. The nitrogen cycle is very important to success with an aquarium, and although it isn’t the same nitrogen cycle that happens in the air, it can be used to introduce students to the concept. Fish tanks can also help illustrate the water cycle from cloud to ocean. Students can even measure how much water evaporates from the tank on a weekly basis. Math and science are very tightly linked, so an aquarium can also help with math lessons! Students can calculate the volume and surface area of the fish tank and convert those measurements from metric to standard units. From the volume, you can have them calculate the weight of the aquarium (hint hint, water weights 8.34 lb/gallon). These fun examples bring math out of the textbook and into real world. Right about now, you may be thinking, this sounds great but where do I start? Thankfully fish tanks aren’t difficult to set up and maintain, but they will require a bit of effort on your part initially. The first thing you will want to read and research is the freshwater nitrogen cycle. This is the article I wrote on it. Many many resources exist online to help you in starting a fish tank, and I encourage you to check out the other fish blogs I recommend for additional resources. My friend Mari at Aquariadise has some wonderful articles to help new fishkeepers such as types of filters & choosinga substrate. The National Science Teachers Association also has guidelines for keeping live animals in the classroom which I highly recommend reading. If native fish are at all an option, I highly recommend them. In the eastern USA we have many stunningly beautiful fish right in our own backyard. You can read more about them in my article: The Beauty in Your Backyard. If native fish aren’t an option, then the next best suggestions I can make are small tetra like the glowlight (Hemigrammus erythrozonus) and X-ray tetra (Pristella maxillaris). Small barbs like cherry barbs (Puntius titteya) and gold barbs (Barbodes semifasciolatus) also make great classroom fish. Zebra danio/glo-fish (Danio rerio) are a staple and great, hardy fish. All of these species need to be in groups larger than 10 because they are shoaling species, meaning they survive best when in groups. They all need a tank larger than a 10 gallon, too. You can read more about these species in my article: Best and Worst Beginner Fish. A few of the glowlight tetra in my personal tank. They are rather hardy and don't mind me leaving them for a weekend. For tank size, I recommend starting with a 20 or 30 gallon tank. It seems counter-intuitive but small tanks are actually harder to keep. Larger volumes of water mean there is more of a buffer in case something goes wrong. Larger tanks also mean you’ll be able to keep more fish which are always delightful to students. I highly recommend plants in an aquarium. They create a soothing natural environment and open new doors for educational opportunities in addition to helping keep it clean. To successfully grow plants you will need a plant-specific light. An aquarium kit should come with a hood and light, but that light isn’t going to be tailored to plants. You will need to get a 6500k full spectrum daylight bulb. Many pet stores also sell these, but hardware stores will have them if your pet store doesn’t. They only need to be replaced once a year to keep your plants growing green and beautiful. Some plant species that are a good, hardy beginner species are anubias, java fern, amazon sword, and duckweed. Pet stores often have these common plants for sale. Aquariums (like all pets) require money, but fortunately for you, there is a nonprofit organization that gives grants for teachers interested in getting a classroom pet. Pets in the Classroom allows teachers to submit proposals for grants to assist with setting up and maintaining classroom pets. Their website also contains lesson plan and habitat ideas for many species of pets. I highly encourage you to check it out. If regulations and demographics allow, you can ask for a small donation from your students to help fund your classroom pet experience. Anderson, K.L. and M.R. Olson. 2006. The value of a dog in a classroom of children with severe emotional disorders. Anthrozoös 19(1): 35-49. Aquatic WILD: K-12 Curriculum & Activity Guide. 2013. Revised ed. Council for Environmental Education, Houston. Daly, B. and S. Suggs. 2010. Teachers’ experiences with humane education and animals in the elementary classroom: implications for empathy development. Journal of Moral Education 39(1): 101-112. Kortschal, K. and B. Ortbauer. 2003. Behavioral effects of the presence of a dog in a classroom. Anthrozoös 16 (2): 147-159. “Responsible Use of Live Animals and Dissection in the Science Classroom.” National Teachers Science Association. www.nsta.org/. Updated: March 2008. Retrieved: 24 Nov 2015. Rotman, E. 2008. Hatching Stewardship. Outdoor California (March-April): 33-35. Rud, A.G. and A.M. Beck. 2003. Companion animals in Indiana elementary schools. Anthrozoos 16 (3):241-251. Rutherford, B. 28 March 2015. 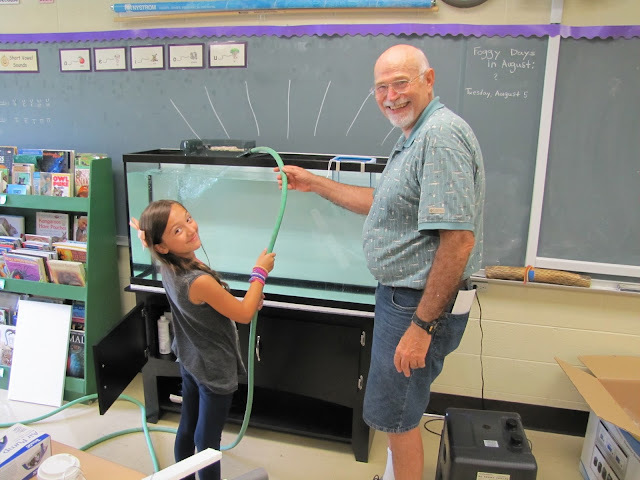 Tanks in Classrooms: Setting Up an Educational Aquarium. Reef to Rainforest Media. Retrieved: 24 Nov 2015. “Trout in the Classroom.” Trout Unlimited. 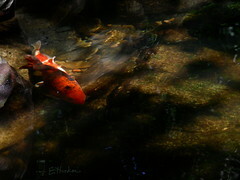 www.troutintheclassroom.org/. Updated: Nov 2015. Accessed: 24 Nov 2015.